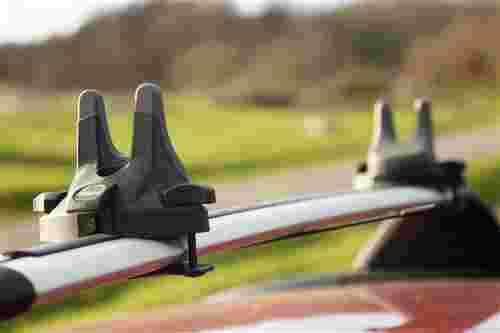 The Thule Surfboard Carrier for surfboards is a simple, great solution especially for surfers like me relying on wind swells. It is easy to adjust and lock the straps with one hand, this way you minimize the risk to getting your board blown away by the wind while putting it on the roof racks. But let me start at the beginning, unpacking the box. The Surfboard Carrier comes in a small box containing all you need to get up to 2 boards secured on the roof of your car. What's included is 4 cradles, 4 brackets, 8 screws, 8 hand knobs and 2 sets of straps with buckles and clips. The brackets fit square and aero roof racks (flat ones up to 8.4 cm). A pretty decent solution from Thule that won't break the bank. To set up the Surfboard Carrier you just put a cradle on top of the rack and a bracket under, push the screws from underneath and secure by screwing the hand knobs. Screw the first one firmly on the front rack and then one on the back rack, leaving the other two a little loose. Lay the rail of your board on the two loose screwed cradles and push away until you can lay the opposite rail on the firmly screwed ones. Tighten the screws and you will see that the angle of the cradles adapts to the shape of your board. Go back and loosen up the first cradles a bit so you can angle them as well, then the fit will be perfect. Don’t forget to tighten everything again. When the board is in place, clip the included straps to the cradles and pull to tighten. Now your board rests on the rubberized surface of the cradles with no need for soft racks. The board is much more stable this way, especially when driving in a highway at high speed in stormy weather. Straps are included and help mounting your board on the roof even when it's super windy. When you are loading your board to the roof in open terrain, you can clip the straps on one side in advance. Then you can keep one hand on the board while reaching for the straps, clipping in and adjusting. That’s a huge advantage, especially when you are alone and it blows 14 m/s or more. There’re two weak spots in the Surfboard Carrier by Thule. The first is that you can carry only two boards with this system. The other is that if you are having different board shapes you need to adapt the position of the cradles from time to time. Still, it only requires a couple of minutes and you’re done, no big issue. At 80 bucks, this premium solution almost feels like it might be silly not to purchase. Overall, I’m impressed with the simple and easy to handle construction. And landing at a modest price of around 80 euros it feels like a good investment, especially for coldwater freaks thriving in the storm. Ergonomic and designed specifically for surfboards, this was a job well done by Thule. Locked and loaded, the Thule surfboard racks have you locked and loaded. Cab 9 have tried to go above and beyond, claiming to have created some new swanky lens tech while keeping the price as low as it could be. We thought we would grab a pair and see if they lived up to the hype.